Dead fish that succumbed to Tilapia Lake Virus at a fish farm in Israel near the Mediterranean coast. Credit: Avi Eldar. An international team of researchers has identified a new virus that attacks wild and farmed tilipia, an important source of inexpensive protein for the world's food supply. In work published this week in mBio, the online open-access journal of the American Society for Microbiology, the team clearly shows that the Tilapia Lake Virus (TiLV) was the culprit behind mass tilapia die-offs that occurred in Ecuador and Israel in recent years. The work also provides a foundation for developing a vaccine to protect fish from TiLV. "Tilapia is one of the most important fish industries worldwide," says Eran Bacharach, a molecular virologist at Tel Aviv University in Israel and one of the lead researchers on the study. "Moreover, because they eat algae, they are ecological gatekeepers for freshwater and they are an inexpensive, important source of protein in poorer countries." 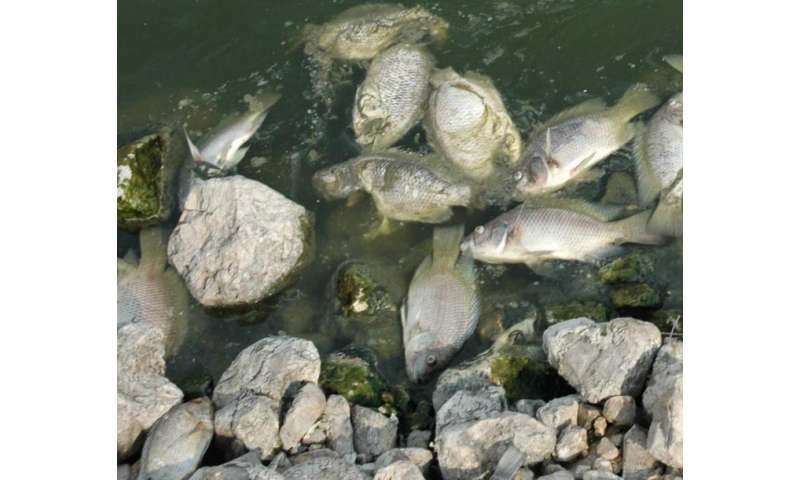 In 2009, both wild tilapia species in Kinneret Lake, also known as the Sea of Galilee, and fish in commercial ponds in Israel began suffering from an unknown disease with high rates of mortality of up to 70%. A couple of years later, fish in commercial ponds in Ecuador also suffered a mass die-off. On first glance, the two diseases seemed unrelated because the fish in Israel showed brain and nervous system symptoms while the fish in Ecuador suffered from liver symptoms. In late 2012, researchers working on both outbreaks sent diseased fish samples to the lab of W. Ian Lipkin, an expert in hunting down new viruses. "This was an atypical viral discovery project," says Lipkin, John Snow professor of epidemiology and director of the Center for Infection and Immunity at Columbia University in New York City. His team's usual approach to tracking down which virus is causing a particular disease is to pursue a genetic sequence analysis of blood, feces or tissues from a diseased animal, remove all the known genetic sequences found in normal animals, and then compare what is left to known sequences in databases. "But, in this instance, what my colleague, Nischay Mishra found didn't look like any previously entered sequences," says Lipkin. In this case, the team found 10 short RNA gene sequences. "The more we studied them, the more convinced we became that what we had represented an entirely new virus," says Lipkin. While nine of the gene segments shared no similarities with any other known viral proteins, one segment looked weakly similar to a influenza C virus protein. The 10 segments also had similar starting and ending sequences, a feature of segmented viruses. And the team showed that the virus replicates itself in the nucleus of fish cells. These characteristics led the team to classify TiLV as an orthomyxo-like virus, related to the same family of viruses as influenza. The team also showed that the virus expresses 10 proteins that correspond to the 10 gene segments. They also sequenced the virus from tilapia from Ecuador and Israel and showed that it was the same virus causing the fatalities in two locations halfway around the globe. Because the viruses from the two sites shared almost identical gene sequences, Bacharach believes they came from the same source. But how the virus traveled between Israel and Ecuador, and in which direction, is still a mystery. "Our research provides the first means of detection - knowing the genetic sequence of the virus is the first step to designing diagnostic and screening assays,"says Bacharach. Such tests will allow fish farmers to detect when the virus is present in a commercial pond and limit its spread. The finding brings other practical applications with it, too, says Lipkin: "Building a vaccine would save billions of dollars and preserve an industry that ensures employment in the developing world and food security."